Hosting an immigrant has its advantages. My wife went to Norwegian language classes (governmental payed) when she came to Norway and met other students from all over the world. Some, from Bulgaria, Brazil and Somalia, are still good friends. Yesterday we were invited to the opening of the Chinese painting exhibition by Frank Woo in Lillestrøm (1/2 hour drive north east of Oslo). Frank is Diane’s best friend’s brother, a friend she also met at language classes. Born in Hong Kong, Frank Woo’s artwork shows an inspirational blending of traditional Chinese colours and textures mingled with modern art and raw emotion. He is a self-taught painter, trained in print-making in Hong Kong. His travels and burning desire for inspiration brought him to Japan, to Tokyo’s Bunka Fashion College to complete his Degree in Illustration. Today he resides in Malaysia where he expresses his artistic inspiration through both paint and sculpture. Distinctive brushstrokes and drips, characteristic of abstract impressionism, give the illusion of chance and movement to his artwork. Meanwhile each drip is highly deliberate, carefully placed and calculated to give the work the desired feel. Wave is Frank’s first Solo exhibition in Europe. His travels through Japan and Asia, and his life as a foreigner, always moving through, relocating, struggling to belong, to find a place to rest has inspired the an art collection full of movement and searching. The cool basic water element, movement, waves of the Asian seas which give Japan and Malaysia life are interspersed with vibrant colours of passion and life, struggle and hope for the future. Franks cool waves interspersed with vibrant reds, black and gold are reminiscent of traditional Chinese painting, and the use of space gives an impression of landscapes and open seas. If any of you want to experience this exhibition in your community, Frank would be delighted to pay you a visit, wherever you are in the world! If so, or if you want to buy some of his breath taking masterpieces, send me a note and I’ll help you get in contact with him! This exhibition is also a part of Chinese Culture Festival in Norway. Read my earlier post about food, song and dance! Wonderful paintings. I hope his tour is very successful. I do agree and hope the same for him! These truly are masterpieces. I’m so glad you were able to share this with us, Renny. I loved the children’s performance as well. Your so right and I’m both happy and excited to be able to share. Yea, the small once where so cute. This is wonderful! Thank you for cheering. The accordion reminds me of home. We had one back in the Philippines. I actually managed to accompany two wedding on it when I was just 10. I don’t think I can play it now though. Woo’s art is very elegant. Your welcome and I’m glad I could take you down the memory lane – I’m sure you’ll remember to play if you had one! I love the idea of the focus in life. Beautiful paintings. I find it really enjoyable being able to spend some time visiting art exhibitions. When he told me, the painting was even more interesting. I’m glad you enjoy art too! That is wonderful. Yes, very much true to his Asian heritage. I think it is wonderful to see all art forms from around the world. Thanks. Yea, there is obvious connection in his work. I think the same and are so excited about Frank bringing it to Norway. A beautiful exhibition! Thanks for sharing this with us, Renny! And the little girls playing accordion, look so cute! Beautiful way of life the artist had! 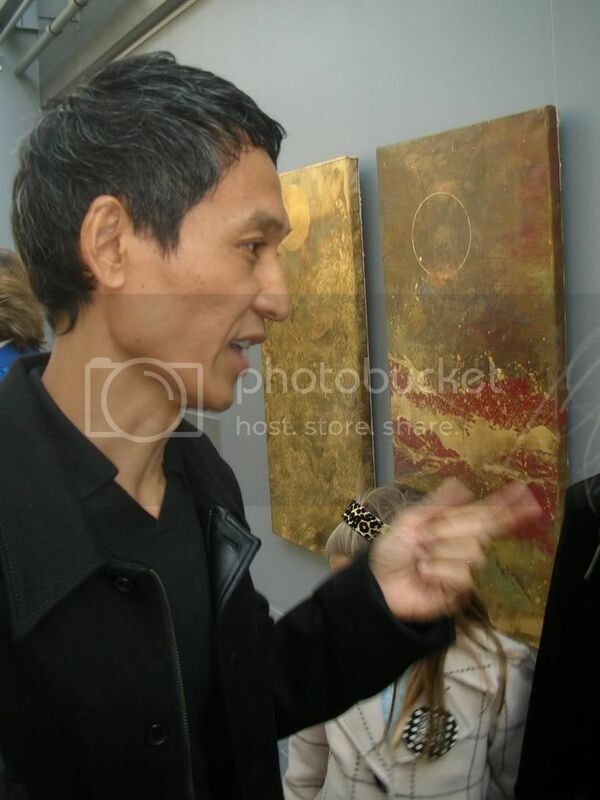 It’s always a chance to meet an artist and to share his art universe! at this time Pierre is crying in front of the TV, watching the match Scotland/Argentine! !!! !Do you watch this too? I do agree; a once in a life time experience and very fascinating. I don’t watch the game – to busy preparing for the coming week. What interesting art! And what a cool way to meet people! Knew you would like it Teena. This is so inspiring indeed and what a nice cultural exchange too :D Yes I’ve enjoyed this and thank you for sharing. Good to know Frank can inspire and I’m just happy to share. Great artwork… and those Chinese kids are so cute! I do agree with your interpretation – well said! Very interesting art. A special style without no doubt. Looks Asian somehow. Love the gold touch. I hope he has successful exhibitions. He should have. Glad you liked them Captain – and interesting, indeed. I do wish him the best of success too. Your welcome – everything for our Captain you know! I was very inspired by the paintings, they are even more captivating in person. Thanks for sharing this with me! You have such a natural talent for describing our experiences. learning a thing or two about other cultures is good. actually immersing yourself, probably by traveling, is great! Yea; it really build down cultural, religious and other barriers you know. Traveling and visit in Blogshere is a great start! Ooh, that art is beautiful! I know art isn’t necessarily supposed to be about beauty, but it’s nice when you find art that is interesting AND pleasing to look at! Thanks for stopping by my blog while we were on the road, it was so nice to see your comment! You’ve got it Jen – I do agree! Your welcome – thanks for keeping us dated! Well, at least his is talented *giggles* Glad you enjoyed the children playing too. Oh Renny these pieces are amazing! We have mural sized art in our home. He has an amazing imagination. I do agree he is great and I just had to share you know. Happy Tuesday to you too – although you’ve probably gone to be now in your part of the world. Very interesting, I like his paintings ! It’s always nice to have an international circle of friends it makes more open minded to everything. BTW have you been to Milano ? I do agree: Life has become much more interesting with Diane brining in people from all the world into the circle. I’m going to Milan in two weeks. how fascinating the connections that were made through language classes. what a wonderful opportunity. thanks for sharing these beautiful works with us. so simple and yet so rich. Yea, and Diane is a Carpe Diem type person. Your welcome – glad you liked them. I love Woo’s art—red is my favorite color and his works are so very expressive. Thank you for sharing it with us. I knew you would Lisa and I’ve seen your great red colored picture at Flickr – they’re great! Your welcome and thanks for stopping by again! Yea, I knew you where ahead of US in that tradition. These li’l performers are really cuty! My husband is into Chinese art.He’d love to see those paintings.He actually owns few hand painted Chinese silk neckties. I wish you have a good week renny! take care! I knew you would love them too CheH! Good to know your husband is into it and loves it too! Wish you a great one too! Your welcome – glad you like it and I do agree; the red and black once are breath taking. beautiful…beautiful paintings Renny….. 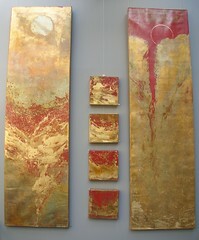 I love the gold leaf…. The accordion is very much used in the country side in Norway too and I thought this little girls played so well. Donica in particular would go crazy over his work, Renny. I need to show this to her!! Thanks for stopping by, its always nice to welcome new readers – also half world away! Welcome back any time and thanks for the link love – I’ll check your later. Fabulous art and the children of course are delightful, always stealing the show! What a neat way to meet friends Diane experienced. Yes, they won our heart of course. International experiences is great I think. What a lovely exhibit. If he comes to the midwest, I’ll try to attend. Thanks and why don’t you invite him over then – I’ll get you in touch with Frank if you like! 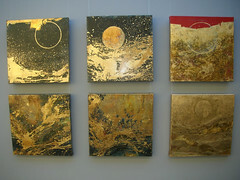 Lovely sparks of gold in those canvases. I love those paintings. Is there any chance of seeing Frank’s exposition in Oslo? Or anywhere else in Norway? I would love to see his art myself. Great to have a visitor and commenter from my TV performance yesterday – welcome back any time! I’m sorry, this was his only exhibition he will have in Norway, but why don’t you invite him to Romania. I forgot to say : Congratulations on your 2007 best weblog award nomination! So many good friends, So many places to travel, And so many wonderful things to enjoy, What a colorful life! You always share us such sunny feel, And I always glad to share your blog with my friends. Thanks Renny!